It is then natural to pose the question of what is the minimal number of ordinary lines that a set of non-collinear points can generate. In 1940, Melchior gave an elegant proof of the Sylvester-Gallai theorem based on projective duality and Euler’s formula , showing that at least three ordinary lines must be created; in 1951, Motzkin showed that there must be ordinary lines. Previously to this paper, the best lower bound was by Csima and Sawyer, who in 1993 showed that there are at least ordinary lines. In the converse direction, if is even, then by considering equally spaced points on a circle, and points on the line at infinity in equally spaced directions, one can find a configuration of points that define just ordinary lines. Theorem 1 (Dirac-Motzkin conjecture) If is sufficiently large, then any set of non-collinear points in the plane will define at least ordinary lines. Furthermore, if is odd, at least ordinary lines must be created. -rich lines. On the other hand, on an elliptic curve, three distinct points P,Q,R on that curve are collinear precisely when they sum to zero with respect to the group law on that curve. Thus (as observed first by Sylvester in 1868), any finite subgroup of an elliptic curve (of which one can produce numerous examples, as elliptic curves in have the group structure of either or ) can provide examples of -point sets with a large number of -rich lines ( , to be precise). One can also shift such a finite subgroup by a third root of unity and obtain a similar example with only one fewer -rich line. Sylvester then formally posed the question of determining whether this was best possible. Theorem 2 (Orchard planting problem) If is sufficiently large, then any set of points in the plane will determine at most -rich lines. Again, our threshold for “sufficiently large” for this is extremely large (though slightly less large than in the previous theorem), and so a full solution of the problem, while in principle reduced to a finitary computation, remains infeasible at present. Our results also classify the extremisers (and near extremisers) for both of these problems; basically, the known examples mentioned previously are (up to projective transformation) the only extremisers when is sufficiently large. Our proof strategy follows the “inverse theorem method” from additive combinatorics. Namely, rather than try to prove direct theorems such as lower bounds on the number of ordinary lines, or upper bounds on the number of -rich lines, we instead try to prove inverse theorems (also known as structure theorems), in which one attempts a structural classification of all configurations with very few ordinary lines (or very many -rich lines). In principle, once one has a sufficiently explicit structural description of these sets, one simply has to compute the precise number of ordinary lines or -rich lines in each configuration in the list provided by that structural description in order to obtain results such as the two theorems above. which among other things implies that any counterexample to the orchard problem can have at most ordinary lines. In particular, any structural theorem that lets us understand configurations with ordinary lines will, in principle, allow us to obtain results such as the above two theorems. As it turns out, we do eventually obtain a structure theorem that is strong enough to achieve these aims, but it is difficult to prove this theorem directly. Instead we proceed more iteratively, beginning with a “cheap” structure theorem that is relatively easy to prove but provides only a partial amount of control on the configurations with ordinary lines. One then builds upon that theorem with additional arguments to obtain an “intermediate” structure theorem that gives better control, then a “weak” structure theorem that gives even more control, a “strong” structure theorem that gives yet more control, and then finally a “very strong” structure theorem that gives an almost complete description of the configurations (but only in the asymptotic regime when is very large). It turns out that the “weak” theorem is enough for the orchard planting problem, and the “strong” version is enough for the Dirac-Motzkin conjecture. (So the “very strong” structure theorem ends up being unnecessary for the two applications given, but may be of interest for other applications.) Note that the stronger theorems do not completely supercede the weaker ones, because the quantitative bounds in the theorems get progressively worse as the control gets stronger. Theorem 3 (Cheap structure theorem) Let be a configuration of points with at most ordinary lines for some . Then can be covered by at most cubic curves. lies on the union of an irreducible cubic curve and an additional points. lies on the union of an irreducible conic section and an additional lines, with of the points on in either of the two components. lies on the union of lines and an additional points. lies on the union of an irreducible conic section, a line, and an additional points, with of the points on in either of the first two components. lies on the union of a single line and an additional points. As mentioned earlier, this theorem is already strong enough to resolve the orchard planting problem for large . The presence of the double exponential here is extremely annoying, and is the main reason why the final thresholds for “sufficiently large” in our results are excessively large, but our methods seem to be unable to eliminate these exponentials from our bounds (though they can fortunately be confined to a lower bound for , keeping the other bounds in the theorem polynomial in ). is a finite subgroup of an elliptic curve (EDIT: as pointed out in comments, one also needs to allow for finite subgroups of acnodal singular cubic curves), possibly shifted by a third root of unity. is the Borozcky example mentioned previously (the union of equally spaced points on the circle, and points on the line at infinity). lies on a single line. By applying a final “cleanup” we can replace the in the above theorem with the optimal , which is our “very strong” structure theorem. But the strong structure theorem is already sufficient to establish the Dirac-Motzkin conjecture for large . A result of Poonen and Rubinstein that any point not on the origin or unit circle can lie on at most seven chords connecting roots of unity; this, together with a variant for elliptic curves, gives the very strong structure theorem, and is also (a strong version of) what is needed to finish off the Dirac-Motzkin and orchard planting problems from the structure theorems given above. There are also a number of more standard tools from arithmetic combinatorics (e.g. a version of the Balog-Szemeredi-Gowers lemma) which are needed to tie things together at various junctures, but I won’t say more about these methods here as they are (by now) relatively routine. 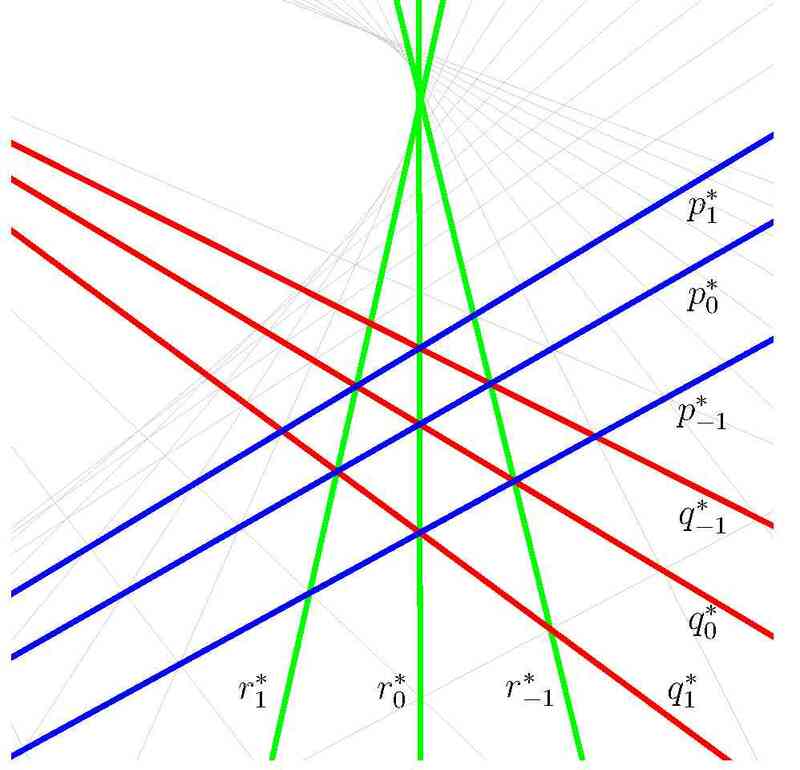 Our starting point was a closer look at Melchior’s proof of the Sylvester-Gallai theorem establishing a non-trivial bound on the number of ordinary lines. The first step was to look at the projective dual of the point set , in which each point is replaced by its dual line . (For this, one should really work in the projective plane rather than the affine plane , but let us ignore this technical detail for this post.) One now has a collection of lines that intersect each other in a number of points; each ordinary line now dualises to a point incident to exactly two of the lines in , a -rich line dualises to a point incident to exactly three lines, and so forth. Theorem 7 (Chasles) Suppose that two triples of lines meet each other transversely in nine distinct points. Then any cubic curve that passes through eight of these points, also passes through the ninth. I blogged about this theorem in this previous post; the result is intimately connected to other classical facts in plane geometry such as Pappus’s theorem, Pascal’s theorem, and the associativity of the elliptic curve group law. This theorem also clearly shows how cubic curves will arise in any analysis of sets with few ordinary lines; using this theorem, one can show that whenever three triplets of points in have their dual lines arranged in the hexagonal formation above, then any cubic curve that passes through eight of these points, also passes through the ninth. By iterating this observation (together with the conclusion from Melchior’s argument that there are large portions of the dual configuration that look like triangular grids), one can obtain the cheap structure theorem from routine combinatorial arguments (omitted here). Actually, these arguments provide not just one way to cover the set by a small number of cubic curves, but a large family of such ways; by comparing these coverings to each other (and making heavy use of Bezout’s theorem) one can eliminate a large number of possibilities for the cubic curves, eventually leading to the intermediate structure theorem. A good model case to consider when trying to understand ordinary lines is the case when the point set can be covered by a bounded number of lines, with a fair number of points ( ) on each line. This is a key case to understand when one wants to improve the intermediate structure theorem; in fact, by some fairly routine (but quantitatively expensive) reductions, one can basically reduce to this case when trying to reduce the number of lines in the intermediate structure theorem and replace it with the weak structure theorem. A more complicated version of these arguments also allows one to handle larger collections of mostly non-concurrent lines. Each triple of non-concurrent lines gives rise to a slightly different multiplicative relationship between the concurrent points on these triples. It turns out that there is a sum-product phenomenon that ensures that these multiplicative relationships are “incompatible” with each other; any configuration of points which has a lot of collinear triples with respect to one of these relationships, necessarily has few collinear triples with respect to other relationships. This can be formalised by arithmetic combinatorics tools, and more precisely a result of Elekes, Nathanson, and Ruzsa, which (by using the Szemeredi-Trotter theorem) established results to the effect that if was a set of reals for which is small, then was necessarily large for suitably nonlinear choices of (e.g. strictly convex). One can reduce the study of collinearity on bounded collections of mostly non-concurrent lines to the Elekes-Nathanson-Ruzsa result by some routine arithmetic combinatorics arguments which we omit here. Theorem 8 Suppose that a set of points lie on parallel lines, with the number of lines being at least two, and with each line containing points of . Then determines ordinary lines. Theorem 9 Suppose that a set of lines lie in families of parallel lines, with the number of directions being at least two, and with each direction having lines. Then there are points that are ordinary (i.e. are incident to exactly two lines in ). The proof of this theorem, exploiting convexity, is elementary enough that we can describe the proof here. Let be the set of all non-ordinary intersection points of lines in , i.e. points incident to at least three lines of . The claim is easy if all the points in are collinear, so suppose this is not the case. Then we may find a vertex in that is a vertex of the convex hull of . This point is incident to at least three lines of , and is thus the endpoint of at least three rays in lines in that lie completely outside of the convex hull of , so that any intersection point on these lines is necessarily ordinary. Of these three rays, one lies between the other two (in the complement of ). Every line in parallel to this middle ray, will meet one of the other two rays, and by the previous discussion, every one of these intersection points is ordinary. Thus we have found two lines in (the lines containing the two exterior rays) which between them capture ordinary points. Removing these lines and iterating, we obtain the theorem. By combining the Menelaus theorem-based argument with Betts’ theorem and some additional combinatorial arguments, we were able to upgrade the intermediate structure theorem to the weak structure theorem. Using additional additive combinatorics tools (exploiting the group (or pseudo-group) structure on cubic curves, which is most well known in the case of elliptic curves, but also survives (in a somewhat degenerate form) for other cubic curves, such as singular cubic curves, unions of three lines, or the union of a conic and a line) we can then get the strong structure theorem. The strong structure theorem shows that sets with ordinary lines are a perturbation (by adding or deleting points, and by applying a projective transformation) from a very explicit example, either arising from a finite subgroup of an elliptic curve, equally spaced points on a circle and line, or points on a line. The projective transform is a symmetry of the problem and is harmless; the only remaining issue is to understand the effect of the points added or deleted on the number of ordinary lines. Due to the very explicit nature of these examples, deleting a point is easy to understand; the main remaining difficulty is to understand the effect that the addition of a single point to one of these explicit configurations has on the number of ordinary lines. In particular, one wishes to prevent the scenario that the addition of such a point removes more ordinary lines than it creates, by being collinear with many pairs of points in the original configuration that were previously defining an ordinary line. Theorem 10 (Poonen-Rubinstein) Let be a point not on the unit circle or at the origin. Then lies on at most seven chords connecting two roots of unity. It turns out (basically by an application of Menelaus’s theorem) that if three chords connecting roots of unity are concurrent, then there is a linear relationship between twelve other roots of unity closely related to the original six roots of unity, namely that these roots of unity sum to zero. The Poonen-Rubinstein paper uses some Galois theory and numerical computation to completely classify all the ways in which twelve or fewer roots of unity can sum to zero, which then leads to the above theorem. It turns out that a variant of the argument also works for secants, showing that a point outside the unit circle can lie on at most secants passing through two roots of unity. One would also like to have a similar result in which “roots of unity” are replaced by “elements of a finite subgroup of an elliptic curve”. Unfortunately, the Galois-theoretic techniques seem to become unavailable, and we were unable to establish the full analogue of the Poonen-Rubinstein theorem for these finite subgroups. We could however show that given a finite subgroup of order , any point not on the curve formed at least ordinary lines with that subgroup, which was good enough for our applications; this came from an order-theoretic argument investigating how triples of adjacent points on the finite subgroup could form collinear triples with . theorems 3 — 6; presumably the set L in theorem 9 is unrelated? This is a strange WordPress LaTeX rendering bug which I have encountered before; there seems to be some collisions between LaTeX images (so, currently, is being rendered as for some reason). Mousing over the image should reveal the LaTeX source. I’ll try to fix it, but usually the problem goes away by itself (somewhat mysteriously). @Lunnon in the paper LM is Kn, and looking those letters on the keyboard I guess it was a misprint that was then copied&pasted in what followed. Sorry I didn’t reloaded the page before submitting to see the reply. I am sorry that this comment is a little bit off-topic, but I believe your blog is the right place to ask this question. Do you know any source where one can get an old paper of Vinogradov on the so-called equidistribution theorem, which says that irrational circle rotations at prime times are equally distributed. Somehow I was not able to find it. Any newer proofs would also work fine. Thank you. Dear Terry, just one trivial remark about Luke Alexander Betts’ part in your paper. In the proof after the lemma 6.5, one should actually apply it times, instead of times. In the current state one actually obtains ordinary points. This is a great result. I noticed one possible issue in the proof. It uses the claim (on page 15 and 48 of the preprint) that for singular cubics, the group structure in can only be (cuspidal curve) or (nodal curve). I think this misses one case: for an “acnodal” curve the group structure is different. I mean a cubic with an isolated point, for instance . It is nodal over in the sense that the tangent lines at the singularity have distinct slopes, but the slopes are complex. That the group structure is different can most easily be seen from the fact that these curves have 3 real inflection points (unlike the other singular cubics), one of which will be the identity at infinity, while the other two ( for the example above) will be points of order 3 in the group. I think the group in these cases is , which would mean that there is another type of set with few ordinary lines, similar to the ones from nonsingular elliptic curves (it would happen in Lemma 7.2). I couldn’t find an explicit reference, but for instance using Silverman’s Arithmetic of Elliptic Curves, Ex.3.5, the group structure is that of the unit circle in , which is indeed . An online reference is http://www.math.leidenuniv.nl/~edix/teaching/2010-2011/tag/davide2.pdf, Theorem 1, the twisted nodal case. Hmm, you’re right, this is a case we overlooked. It appears that one can rectify the issue, basically by replacing “elliptic curve” by “elliptic curve or the smooth points of an acnodal cubic curve” throughout the paper, which makes some things (including the statements of some of the main theorems) a bit uglier, but otherwise the arguments seem to go through. Ben and I will try to amend the preprint accordingly over the next few days; thanks for pointing it out! Does Proposition 8.2 contain a typo? It seems that adding a single point to gives an example with at most ordinary lines but which is not (in general) a Böröczky or near-Böröczky example – contradicting 8.2 for large enough . Similarly in the proof I think only determines $m$ tangent lines at the unit circle, rather than . If this is not a typo and I am misunderstanding the situation any clarification would be appreciated! Yes, this is a typo, sorry: 4m should be 3m (and 2m tangent lines should be m tangent lines). (For the purposes of proving Theorem 2.4, the change doesn’t end up mattering, indeed we could even go down to 2m and have the same result.) We’ll incorporate this correction in the next version of the ms. Thanks for the help. Thinking about this more, it seems that is the correct statement here since adding a single point to can result in non-Böröczky examples with at most ordinary lines, e.g. adding a general point on the line at infinity, or adding the origin if is odd. The proof then doesn’t need the full power of 7.6, since in the first case just the ordinary lines to points at infinity are sufficient. In fact, just replacing by in a handful of places clears up all the confusion I initially had. Ah, yes, you’re right. I see now how the problem arose in the first place; half the argument is written for X_2m (being adapted to part (i) of Proposition 2.1) and the other half for X_4m (being adapted to the other parts of Proposition 2.1). As you say, replacing m by m/2 in a number of places fixes everything. Reblogged this on Minh Ngo's blog.